In 2003, Andy and I decided to move to Brookhaven and join all of our Furman Alum friends that were planted in Ashford Park! Our parents couldn’t believe we bought a 1950s house without a garage! And, they wondered why in the WORLD we wanted to live in Brookhaven? Our real estate agent at the time even called us “Yuppies” for our decision. Yet, that decision in 2003, is still one of the BEST decisions we have ever made! We LOVE Brookhaven! In the past 13 years, we’ve lived in 3 houses all within a mile of one another. We started in Ashford Park, moved to Brookhaven Gardens, and are now in Brookhaven Fields! Andy and I have literally worked and played in virtually every area of Metro Atlanta! So, why did we choose Brookhaven? 1. 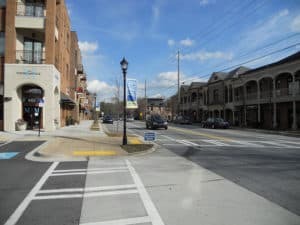 Our house in Brookhaven is 2 miles from the best restaurants, shopping and night life in Atlanta! I can be at Phipps, Hal’s Steakhouse, or Lenox in 8 minutes flat! 2. Brookhaven is NOT in City of Atlanta or Fulton County! So, we don’t have to pay the price tag to live in Buckhead or the taxes associated with the city! 4. Brookhaven is it’s own CITY! Yes, that’s right! Several years ago, Brookhaven incorporated. We now have our very own mayor, police, and parks and recreation system! Our police ROCK (even though they’ve ticketed me for texting at a red light). I’ll forgive them for their responsiveness and professionalism. And, our parks system has added tremendous value. There is always something going on in Brookhaven – whether it’s our Saturday Farmer’s Market on Dresden, Food Truck Wednesdays at Blackburn, or the Annual Brookhaven Arts Festival. 5. Walkability! If you live on the Dresden corridor, you have Village Place with bars, restaurants and shopping! If you live in Historic Brookhaven, you can walk to Mellow Mushroom, Capital City Club, or Hudson’s! And, if you live on the Windsor Pkwy/Osborne corridor, you have Town Brookhaven at your fingertips! Not close to any of these? You live close to Keswick Park, the fantastic new development on Johnson Ferry near Brookleigh, or Brittany Club! You name it, Brookhaven’s got WALKABILITY! I could go on and on and on! However, I realize Brookhaven is not for everyone! That’s the great news about our team! I could list 5 reasons you’d want to live in every area of Atlanta! Give us a call at 404-419-3619 today whether you want to talk Brookhaven or other Metro Atlanta areas that would be the best fit for YOU!